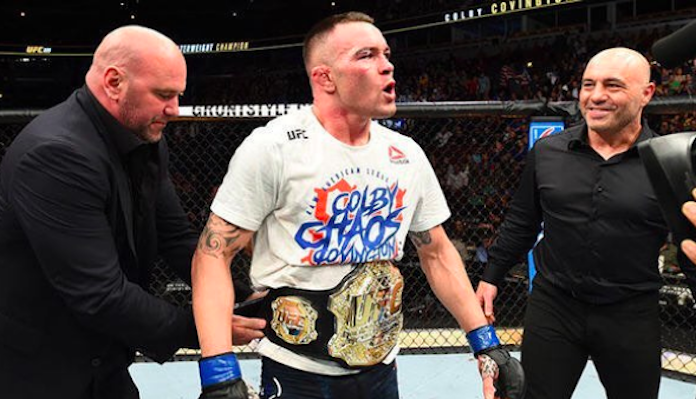 Colby Covington says he is willing to fight Darren Till or another opponent under the right conditions. The former UFC interim welterweight champion, Covington, was recently snubbed by the UFC of his promised title fight with Tyron Woodley. The promotion opted to book “The Chosen One” for a fight with perennial division contender Kamaru Usman at UFC 235. That decision left Colby Covington absolutely furious, which resulted in “Chaos” challenging the UFC to release him. After the UFC failed to take Colby up on his daring offer, Covington now appears willing to accept a proposed fight with former division title challenger Darren Till.. under the right conditions. Earlier this week BJPENN.com Chris Taylor reported that a welterweight fight between Darren Till and Colby Covington was being targeted to headline the promotions Fight Night card on March 16 in London, England. I’m told the UFC is looking to book a welterweight fight between Colby Covington and Darren Till for #UFCLondon on March 17. Covington has recently stated that he will hold out for his promised title shot, so we shall see what happens. Who do you think would emerge victorious if the UFC is able to book a welterweight fight between Colby Covington and Darren Till for March’s UFC Fight Night event in London? Sound off in the comments section PENN Nation!